The most familiar type of microscope is the standard light microscope which is used in science laboratories across the world. The base (L) and arm (G) are usually one single piece of cast metal. The arm is the correct place to grip the microscope when carrying it while supporting the base with the palm of your other hand. Color the arm green and the base red . The body tube (C) allows the light to pass upward to where the user’s eye is. A lens inside the eyepiece (A) usually has a magnification of 10x. Color the body tube brown and the ocular lens orange . The stage (I) is the platform that supports the specimen to be observed. The stage has a hole in its center to allow light to pass through, so specimens must be positioned over the top of this hole. Color the stage blue . Stage clips (J) on the stage can hold the slides in place; color the stage clips gray . Light microscopes use either a bulb or a mirror (M) as their light source. Color the light source yellow . The switch for this light is usually found on the base of the microscope, and sometimes on the power cord. You can control how much light goes through the specimen by adjusting the diaphragm (K). Color the diaphragm light green . After the light has passed through the specimen, it enters the objective lens. The shortest of the three objectives is the scanning-power objective lens (N), and has a power of 4X. Color the 4x objective black . The second objective is the low-power objective (F), which usually has a magnification of 10 times (10x). Color the low-power objective purple . The high-power objective lens (H) has a magnification of 40x. Color the high-power objective red . The total magnification obtained is the product of the eyepiece times that of the objective lens. You can easily switch objectives by turning the rotating nosepiece (E). Color the nosepiece blue-green . 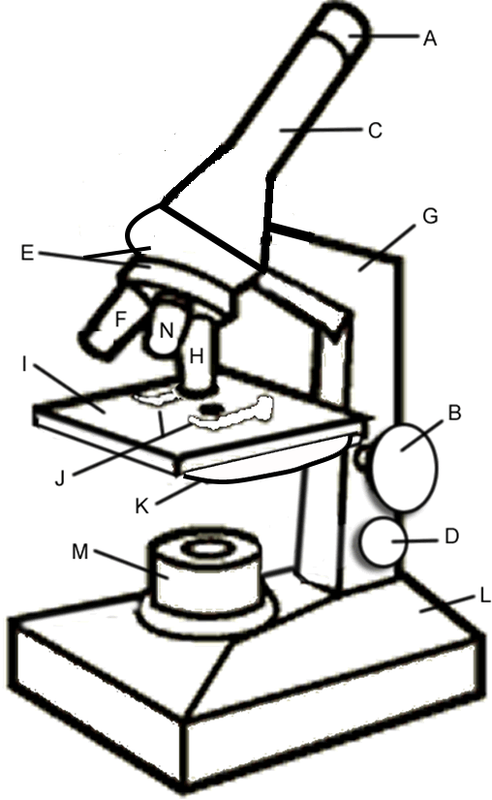 The coarse adjustment knob (B) is the larger on your microscope. You will use this primarily to focus on your specimen. DO NOT USE THE COARSE ADJUSTMENT KNOB ON HIGH POWER (40X), it will crack your slide. Color this knob pink . The fine adjustment knob (D) is also for focusing when using the high power objective. Color this knob tan .